The four states of matter are the subjects of the artworks selected for this exhibition, each redefining the interrelation between phenomenon and observer through the integration of a new artistic language within the context of a scientific experiment. The embodiment of artistic intent in plastic and figurative forms of representation comprises a dramatic moment in human history, defined by revolutionary processes to master matter in all its manifestations. The development of the visual arts prompted the invention of new processes to represent and interpret the artist’s reality – which has become increasingly more abstract and teeming with conceptual content. Technique (and later technology) has been a constant focus along this historical parabola. What if the proliferation of technology were navigated by an evolving understanding of the abstract nature of reality? Would not this lead to a profound shift in previously held conceptions of society? What will be the role of the artist under these circumstances? Where do the trajectories between science, technology and art intersect, or even completely blur? The potential renaissance in question is unleashing an enormous availability of scientific and technological knowledge together with a cross-disciplinary change in perspective. Tools previously only considered useful for scientists locked away in labs have found ways to spread out. This expansion of participatory processes is characterised by hacker societies that require the initiation of a new form of art and science. The time of vertical expertise is over. The “States of Matter” exhibition seeks dimensions of meaning and beauty by unfolding nature’s innermost secrets. Visual concepts such as light, color, materiality and movement are reinvented through plasma physics, fluid dynamics, low temperature crystallisation, and experiments testing the chemical origins of life. The four classical states of matter (solid, liquid, gas and plasma) are the subjects of the artworks selected for this exhibition, each redefining the interrelation between phenomenon and observer through the integration of a new artistic language within the context of a scientific experiment. ALFREDO CIANNAMEO presents his plasma organ IONESIS together with sound artist DORON SADJA for the creation of a new sonic plasma performance by using three multi-electrode discharge tubes originally invented by Nikola Tesla. This instrument transforms six electronic audio channels into twelve high voltage sources, initiating an electro-sonic reaction in light plasma as a result. 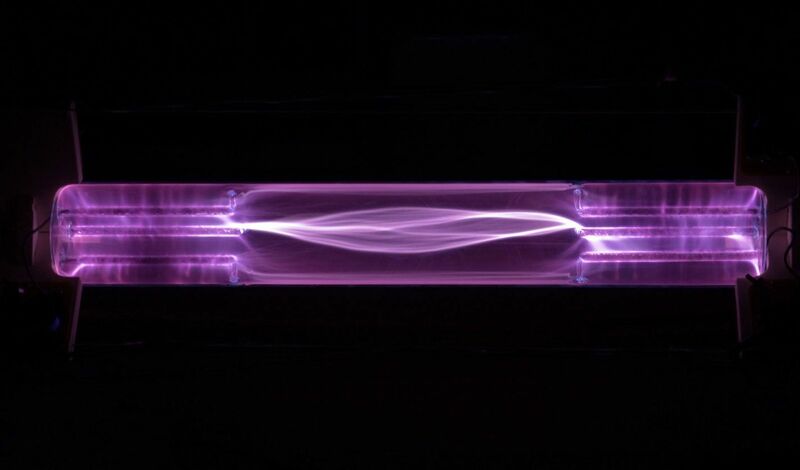 The focus of the work lies in investigating the discharging qualities of plasma. When an electrode discharges the electric field generated by this (electrode) interacts with other electric fields also discharging electrodes within the tube. This result visually into a complex configuration of light cells that are intertwined with one another. The conduction of light is synchronized with the sound in the space. Based on the synaesthetic relation between light and acoustics, Ionesis conjures up an immersive cosmological experience. JEAN-MARC CHOMAZ, LAURENT KARST & JULIE LAFAURIE-JAVORE (researcher at École Polytechnique) LABOFACTORY - EXOPLANET The Exoplanet installation questions the new materiality of science, which, by discovering extra solar planets, has revived the fantasy of other islands, of other us. 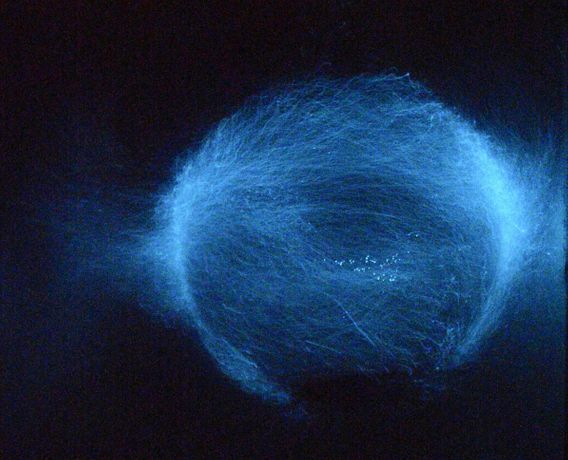 Exoplanet is an intimate inverted cosmos inhabited by the bioluminescence of living phytoplankton Pyrocistis Noctiluca. The room is plunged into darkness; the spectator tames the night and awakens. Pale blue pulses draw a vortex, an evanescence of spirals and stripes. The sparks are produced by the oxidation of the luciferin, a protein photosynthesized during the day by the living cells. These ephemeral and erratic bursts are microperformed by the plankton interpreting a score stimulated by a spinning glass sphere. Exoplanet evokes the origins of our planet when photosynthesis in the oceans starts painting in blue the sky. Nowadays, the phytoplankton still produces the oxygen of the air by absorbing CO2. At the new moon, its bioluminescence is visible from space and traces eddies in the ocean. Exoplanet was made possible with the support of the fondation Daniel et Nina Carasso, the Laboratoire LaSIPS of the University Paris-Saclay and the École Polytechnique. AKITOSHI HONDA - CRYSTAL STUDY is an installation which turns the non-perceivable process of crystallisation into an artistic light installation. The earth is developed in decade and is even still developing every minute, every second: we can say it is crystallisation. For a human being it is difficult to sense phenomena such as global warming in real time, because the timescale is too long and the change too small. Since long ago humans have tried to observe such intangible environmental phenomena., for example Stormglass (aka FitzRoy glass, which developed in 19th century for the weather forecast. This device reacts with chronological change from temperature, atmospheric electromagnetic noise, which changes in a long time scale that humans can’t observe or feel clearly. 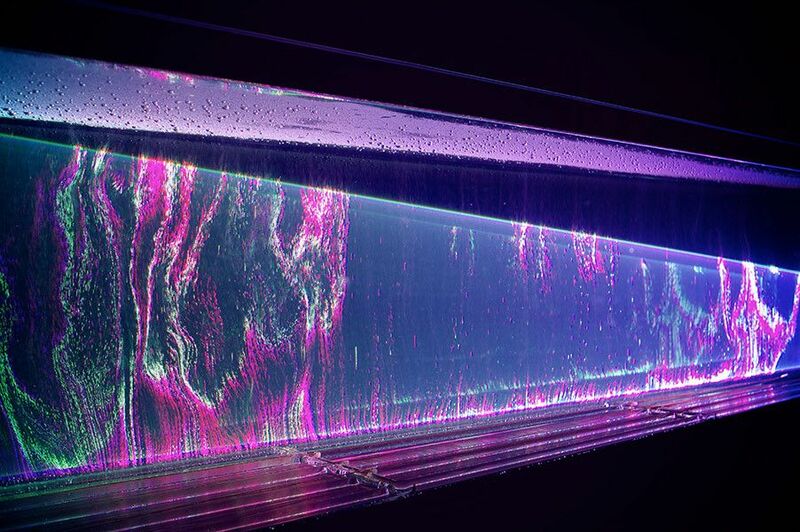 In this project, the crystallisation process in Stromglass is translated to a human perceivable phenomenon in an aesthetic way with help with modern technology. A glass tube is filled with a special liquid which reacts with temperature, the electronic magnetic field, etc. This reaction happens on a molecular level and is impossible to observe with the human eye, but laser light makes this process visible. Light scattering and absorption is represented as a light pattern. Such phenomena are also applied in the scientific analytic method known as spectroscopy. PHILIP SILVA & FELIX E. KLEE – scanning tunneling microscope – is a device with subatomic resolution. A needle, just one atom wide at its end, is moved very close to a sample. It is then scanned over the sample’s surface. For determining the distance between needle and surface at each point, a tunneling current is measured, a quantum mechanical effect. The result is an image of the surface. Each spot in the image corresponds to one atom. In the context of the installation, the microscope is used as a realtime video filter (1). It outputs the superposition of two states (3). 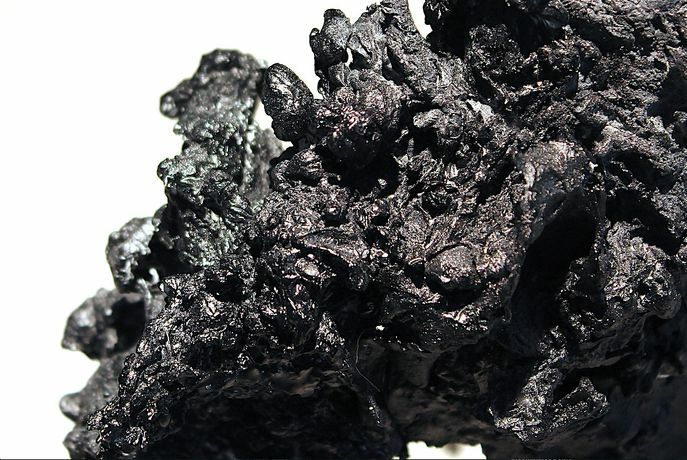 Graphite is a crystalline state of carbon with hexagonal symmetry. Superimposed on the scan of graphite is disturbance caused by the presence of observers of the measuring process (2). The device is very sensitive. Only when quiet it is possible to see a clear image of the crystal. For building the microscope, Philip Silva and Felix E. Klee collaborate with Luka Karoli, an electrical engineer and Ana Bulović, a biophysicist. The team’s mission is to provide a cheap device for home use and trigger the nanotech maker revolution. BYRKE LOU - CTU-ISBTM ctu – isbtm is a series of representations and clippings of the milky way. The objects are produced from glass as glass is what we usually look through in scientific processes. The qualities of glass thereby become an intrinsic feature of the technologies we develop and also of what we observe and understand as existing. When and how does a myth become a scientific fact? 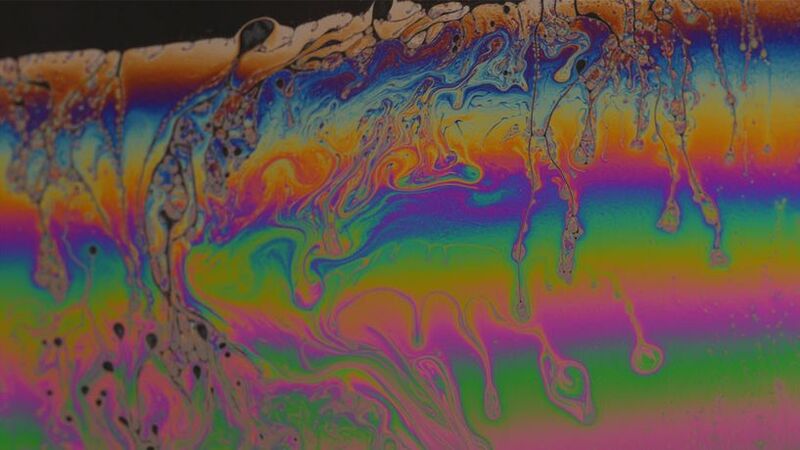 Lecture by Hans ­Jörg Rheinberger (Max Planck Institute for the History of Science) on the interface between the liquid and the solid in scientific research. Hans ­Jörg Rheinberger is Emeritus scientific member of the Max Planck Institute for the History of Science in Berlin, Dr. and honorary professor at the Institute for Philosophy and History of Science of the Technical University Berlin. The main focus of his research lies in the history and epistemology of experimentation in the life sciences. By bridging the gap between the study of history and contemporary cutting­edge sciences, such as molecular biology, his work represents an example of transdisciplinarity as emerging in the present knowledge­based society. The Swiss­born scientist studied philosophy and biology in Tübingen and Berlin, Germany. He received his M.A. in philosophy in 1973, his Ph.D. in biology in 1982, and his habilitation in molecular biology in 1987. He was Assistant Professor at the University of Lübeck, Germany, and Associate Professor at the University of Salzburg, Austria. Since 1997, he has been a Scientific Member of the Max Planck Society and Director at the Max Planck Institute for the History of Science in Berlin. In Alien Agency, Chris Salter tells three stories of art in the making. Salter examines three works in which the materials of art—the “stuff of the world”—behave and perform in ways beyond the creator’s intent, becoming unknown, surprising, alien. Studying these works—all three deeply embroiled in and enabled by science and technology—allows him to focus on practice through the experiential and affective elements of creation. Drawing on extensive ethnographic observation and on his own experience as an artist, Salter investigates how researcher-creators organize the conditions for these experimental, performative assemblages—assemblages that sidestep dichotomies between subjects and objects, human and nonhuman, mind and body, knowing and experiencing. Chris Salter is Concordia University Research Chair in New Media, Technology and the Senses, Co-Director of the Hexagram network, Director of the Hexagram Concordia Centre for Research and Creation in Media Art and Technology and Associate Professor, Computation Arts in the Department of Design and Computation Art at Concordia University, Montreal. His artistic and research interests revolve around the development and production of real time, computationally-augmented responsive performance environments fusing space, sound, image, architectural material and sensor-based technologies. Such projects range from small and large scale, public driven installations where the line between spectators and performers is blurred to traditional performance environments with trained performers that are augmented with computational and media systems. Evelina Domnitch & Dmitry Gelfand (NL/RU) create sensory immersion environments that merge physics, chemistry and computer science with uncanny philosophical practices. Current findings, particularly regarding wave phenomena, are employed by the artists to investigate questions of perception and perpetuity. Such investigations are salient because the scientific picture of the world, which serves as the basis for contemporary thought, still cannot encompass the unrecordable workings of consciousness. Having dismissed the use of recording and fixative media, Domnitch and Gelfand's installations exist as ever-transforming phenomena offered for observation. Because these rarely seen phenomena take place directly in front of the observer without being intermediated, they often serve to vastly extend the observer's sensory envelope. The immediacy of this experience allows the observer to transcend the illusory distinction between scientific discovery and perceptual expansion. Laurent Karst (FR) is an architect / designer who graduated from the Strasbourg School of Architecture and the Domus Academy Milan (industrial design). In 1995 he was awarded the Villa Medici award for his research "mobilize industrial waste - a challenge to architecture and design." He worked as a project manager, designer and architect in various international architecture agencies, particularly Jean Nouvel and AREP, part of SNCF. In 2006, he founded Atelier 16 - Architecture, where he developed small-scale projects with a strong concern on the issue of the material. For over 10 years he has formed part of Labofactory, an interdisciplinary collective that consists of scientist Jean-Marc Chomaz, architect Laurent Karst and composer Francois-Eudes Chanfraults. Together they explore the cross-overs between the imagination of art and science. Alfredo Ciannameo (IT/DE) is a new media artist researching scientific principles with sensorial applications in order to approach natural phenomena through a practice of synaesthetic understanding. He graduated from the Interfaculty of the Royal Academy and Royal Conservatory of The Hague, The Netherlands, with a Master in ArtScience. He cultivates a strong interest in the intersection between physics science and sensory immersivity. With his plasma organ Ionesis, he took part in various exhibitions in the Netherlands, Italy, Germany and Brazil. He is co-founder and art director of the project space SPEKTRUM | art science community in Berlin since 2014. Doron Sadja (US) is an American artist, composer, and curator whose work explores modes of perception and the experience of sound, light, and space. Working primarily with multichannel spatialized sound – combining pristine electronics with lush romantic synthesizers, extreme frequencies, dense noise, and computer-enhanced acoustic instruments, Sadja creates post-human, hyper-emotive sonic architecture. Although each of Sadja’s works are striking in their singular and focused approach, his output is diverse: spanning everything from immersive multichannel sound pieces to sexually provocative performance / installation works, and stroboscopic smoke, mirror, laser, and projection shows. Nicky Assmann (NL) explores in her work how the body with all its senses perceives and relates to objects and spaces and is interested in the mental process and physical activity of seeing. She refers to scientific research and natural phenomena and experiments with the properties, behaviour and aesthetics of solid and liquid materials. The skin, both visible as invisible is a recurring metaphor in her work and is extended into the space. This phenomenological approach results in the use of different media, like self-made instruments & objects, video, AV-performances and kinetic light installations. With these spatial installations she creates dynamic and temporary spaces in which the sensorial embodied experience takes a central point. Joris Strijbos (NL) is a Rotterdam-based artist whose work focuses on the synaesthetic relation and interaction between moving image and sound. His work consists of a series of kinetic audiovisual installations and new media performances inspired by an ongoing research into cybernetics, emergent systems, artificial life and communication networks within groups. In his installations he combines artificial, electronic and digital media with models and algorithms based on biological systems. In many of the pieces, the viewer witnesses a process in which machines, computer programs and the physical world interact with each other, resulting in a generative and multi sensorial composition. Akitoshi Honda (JP) is an artist interested in the relations between human perception and media in the realm of art, design and science. He worked with physical computing and programming for several of his projects to express his idea and concept. He has had exhibitions in several places in Europe and Asia such as Japan Media Arts Festival, ISMAR, Enter festival. He lives in Berlin since 2007. Philip Silva (DE) studied physics at RWTH Aachen, specializing in theoretical particle physics. Since 2008 he has been working as a software engineer in the area of telematics and telecommunications, and later – as part of a startup in Berlin – language learning. At Fab Lab he develops EasyLab, a system for managing access to digitally controlled machines such as 3D printers, laser cutters, and CNC mills. Felix E. Klee (DE) has an academic background in architecture and physics. For the past years he led the life of a digital nomad, working remotely as a freelance programmer from changing locations. Since last June in Berlin, he has been exploring digital manipulation of matter at various length scales, ranging from architecture-scale objects down to atoms. Byrke Lou (DE) Byrke Lou studied Physics (B.Sc.) at the University of Bremen where she specialized in the theoretical physics’ field of complex systems and consequently digital media (M.A. ), fine art and composition at the University of the Arts Bremen. She observes and builds media and technologies and analyses their interface with the human, society and the perceived reality. She is interested in processes of model-building, proof-testing and evidence production in the latest developments of sciences, technology and media, and produces experiences and data thereof in the form of audio data, visual data and 3D data. Her work has been shown at Ars Electronica, Transmediale Berlin and CTM Berlin and is developed in close cooperation with scientists from scientific institutions around the world, currently the Max Planck Institute of Molecular Cell Biology and Genetics in Dresden, the Heinrich Hertz Institute Berlin and the Freie Universität Berlin. This exhibition forms part of the 48 Stunden Neukölln art festival and was made possible with the support of the Creative Industries Fund NL, Fondation Daniel et Nina Carasso, the Laboratoire LaSIPS of the University Paris-Saclay and the École Polytechnique.